One of the biggest telecom company in the country announced that they will charge everyone who will call the emergency hotline '911'. 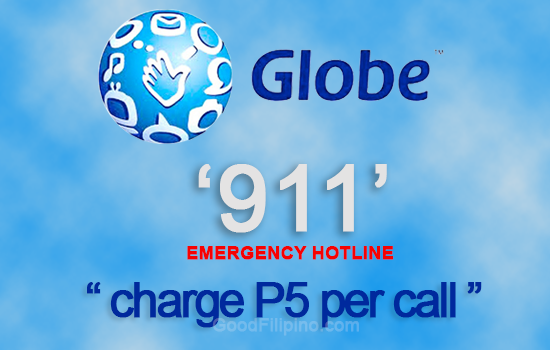 Globe Telecom, Inc. said that they will charge additional P5 per call on top of regular voice charges for 911 calls. According to the statement released by Globe General Counsel Froilan Castelo, he said that charging 911 calls is suggested by the government to discourage prank calls. The government wants to minimize the prank calls that might occur and to get only the real emergency reports. Castelo said, "We would also like to inform our customers that those calling the hotlines will incur regular voice charges plus an additional P5/call for those calling the 911 hotline." The 911 emergency hotline is ready to use starting this August 1, 2016. He said, "We are also expediting migration of our system to immediately enable transmission of SMS or text messages thru 8888 and we are confident that we will be able to achieve this target within the timeframe of 30-45 days given to us by the government." As promised by President Rodrigo Duterte, 911 hotline become nationwide and it set to replace the Patrol 117 as the Philippines' national emergency hotline number while the 8888 will be the citizens' complaint hotline number. "As a telecommunications provider, Globe recognizes the importance of such communication tool for the government to effectively carry out its initiatives for the benefit of the public," Castelo added. What do you think of this action by Globe Telecom? Please share your thoughts below. Comments or suggestions about "Globe Telecom to charge P5 on every calls to 911 Emergency Hotline" is important to us, you may share it by using the comment box below.